The funeral for former President George H.W. Bush may be one of the most watched services in American history with millions of Americans seeing the deep-rooted traditions of the Episcopal Church for the first time. Wednesday the National Cathedral, the seat of the church in the United States, welcomed presidents, congressmen and women, hundreds of other figures past and present and millions of Americans to collectively mourn the passing and celebrate the life of America’s 41st president: George H.W. Bush. The highlights of the service were the moving stories and tributes to a man remembered for his humility, sense of humor and an unquestioned devotion to God. Playing the backing role for these tributes was the service itself, one deeply rooted in ancient tradition and theology. Many of the traditions seen during President Bush’s funeral are laid out in the Book of Common Prayer, a sort of guidebook to Episcopal services, among other things. Rev. Russ Levenson, the Bush family priest and close family friend, offered Wednesday's sermon. Much of his sermon helped to humanize the former president, remembering him not as a former head of the state, but a man committed to God, country. family and friends. However, intertwined with memories of President Bush was, to Rev. Boulter, a central idea of death to Episcopalians like the former president. The service also typically involves a sermon, readings from Scripture and sometimes communion, though the Bush family decided not to include communion in the service. While the Book of Common Prayer lays out much of the service, the family has considerable influence on the service including music selection and readings. Family plays such an important role in the burial service because the service is not like normal church service. Rev. Boulter says it is a mixture of worship and tribute that makes no distinction between former president or nextdoor neighbor. “Obviously it’s a worship service where we worship God. But it’s also a time of real remembrance and celebration, both grieving and celebration of the departed loved one,” Rev. Boulter explained. “It’s actually an Easter service. Just as Jesus Christ was raised, our mortal bodies will be raised from the dead." While the church makes no distinction between president and neighbor, it is hard to underestimate the importance of President Bush and the office of the president. However, each person speaking at President Bush’s funeral remarked the role his faith played in his daily life and work. Rev. Boulter believes that faith helped guide President Bush through his life in public service. 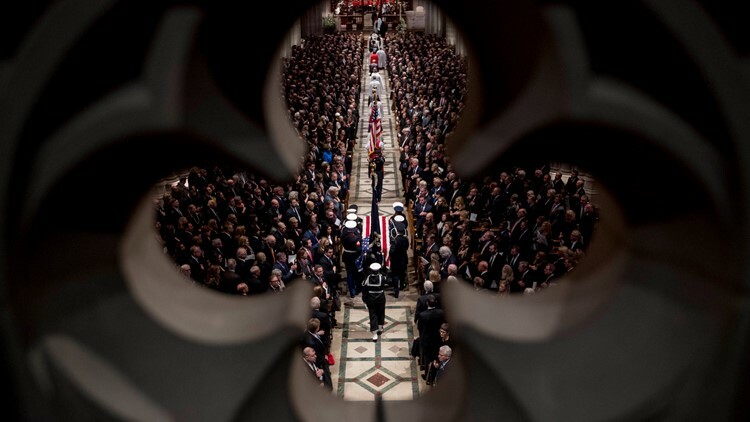 The effect of President Bush’s character was nearly impossible to dispute as the mourners inside the cathedral embraced each other in a sense of neighborly love, regardless of party affiliation. Notably, the passing of candy from former President George W. Bush to former First Lady Michelle Obama, a running joke between the two, and the theme of President Bush’s friendship with the man who defeated him in the 1992 election, former President Bill Clinton. President Bush will have a private funeral Thursday at his home parish in Houston for family and friends before being laid to rest next to his beloved wife Barbara and his daughter Robin on the grounds of the George H.W. Bush Presidential Library in College Station.